^ a b Barnes, Robert D. (1982). Invertebrate Zoology. Philadelphia, PA: Holt-Saunders International. pp. 105–106. ISBN 0-03-056747-5. ^ Gordon D, Love et al. (2009). “Fossil steroids record the appearance of Demospongiae during the Cryogenian period”. Nature 457: 718-721. doi:10.1038/nature07673. ^ Riding, R.; Zhuravlev, A. U. (1995). “Structure and diversity of oldest sponge-microbe reefs: Lower Cambrian, Aldan River, Siberia”. Geology 23 (7): 649-652. doi:[[doi:10.1130%2F0091-7613%281995%29%E2%80%8B023%3C0649%3ASADOOS%3E%E2%80%8B2.3.CO%3B2|10.1130/0091-7613(1995)​023<0649:SADOOS>​2.3.CO;2]]. ^ J. N. A. Hooper and R. W. M. van Soest (2002). “Class Demospongiae Sollas, 1885”. 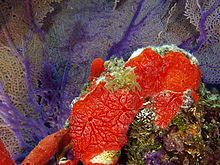 Systema Porifera. A guide to the classification of sponges. New York, Boston, Dordrecht, London, Moscow: Kluwer Academic/Plenum Publishers. ^ C. Borchiellini, C. Chombard, M. Manuel, E. Alivon, J. Vacelet, and N. Boury-Esnault (2004). “Molecular phylogeny of Demospongiae: implications for classification and scenarios of character evolution”. Mol. Phylogenet. Evol. 32 (3): 823–37. doi:10.1016/j.ympev.2004.02.021. PMID 15288059. ^ Lavrov D.V., Wang X., Kelly M. (2008). “Reconstructing ordinal relationships in the Demospongiae using mitochondrial genomic data”. Mol. Phylogenet. Evol. 49 (1): 111–124. doi:10.1016/j.ympev.2008.05.014. PMID 18583159. Bergquist, P. R. Sponges. Berkeley, CA: University of California Press; 1978. Hickman, C. P. Pages 86–103 in Biology of the Invertebrates. Saint Louis, MO: C.V. Mosely Publishing. Kozloff, E. N. Pages 74–91 in Invertebrates. Philadelphia, PA: Saunders College Publishing; 1990. Kelly-Borges, M. and S. A. Pomponi. 1994. Phylogeny and classification of lithistid sponges (Porifera: Demospongiae): a preliminary assessment using ribosomal DNA sequence comparisons. Molecular Marine Biology and Biotechnology, 3(2): 87–103. Reitner, J. and D. Mehl. 1996. Monophyly of the Porifera. Verhandlungen des Naturwissenschaftlichen Vereins in Hamburg. 36: 5–32.